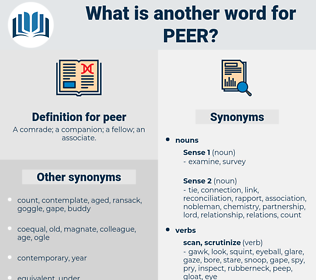 What is another word for peer? partners, clusters, comrades, groups, panels. Les, partner, expert, experts, companion. 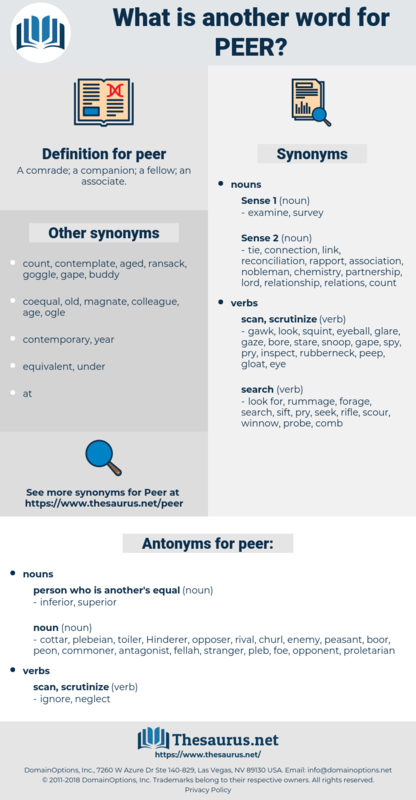 peer-to-peer, peer-review, peer-driven, peer-led, sibling. cottar, plebeian, toiler, Hinderer, opposer, rival, churl, enemy, peasant, boor, peon, commoner, antagonist, fellah, stranger, pleb, foe, opponent, proletarian. When he fell he had been supported from the field by, and he actually died in the arms of the young peer. And from the little writing room Locke saw Bailey Weegman peer forth, his eyes following the mysterious one until the latter disappeared. baron, peer of the realm, life peer, viscount, earl, marquess, viscountess, earl marshal, duke.